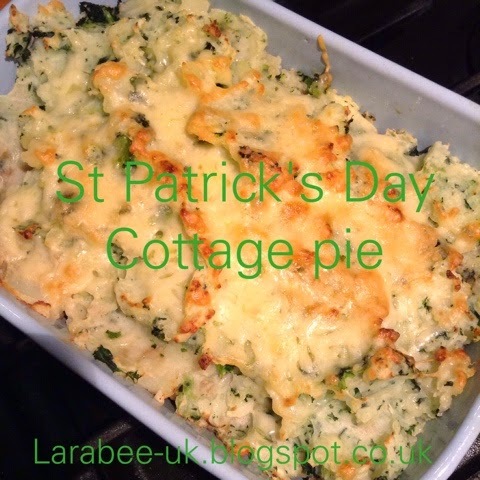 This St Patrick's day we came up with a St Patrick's Day cottage pie, I have to say, my veggie version was delicious and I'm assured from The Hubs that this version was totally delicious too! We won't be keeping this for once a year, I know that much, and it's an extra portion of veg which is always a bonus. 1. Fry onion in the oil until golden, add mince until browned. 2. Add flour and cook, stirring for 1 minute. Gradually blend in Guinness and stock cube. 3. Cook, stirring until mixture thickens and boils. Cover and simmer for 25 mins. 4. Turn mind mixture into a 1.1l ovenproof dish. 5. Meanwhile, cook potatoes in boiling water after 10 mins add the kale and leek and cook for a further 5-10 mins until potatoes are tender. 6. Drain well, mash with butter and milk. 7. 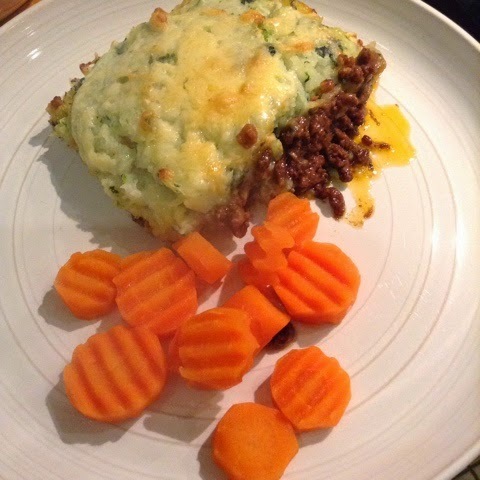 Cover mince mixture with potato and top with cheese. 8. Bake at 190oC for 1 1/4 hrs until golden.